When you first open a properly exposed Raw image, it usually looks flat and lacks punch. It’s nothing at all like you saw when you clicked the shutter. That image now requires processing in Photoshop’s Adobe Camera Raw (ACR), Lightroom, or the Raw converter of your choice. You can, and should, adjust the exposure, set the global white balance, capture sharpen, handle noise, etc., in ACR or its equivalent, but a discussion of Raw processing will be for future posts. For now, in general, just make sure you leave some room at the dark and light ends of the histogram, if possible, and leave the image a little flat to open in Photoshop. It’s always easier to add than to remove contrast and saturation in your final Master image. So, what is the difference between contrast and saturation, and how do you add one, the other, or both? Contrast is the difference between light and dark tones. You can also think of it as the separation between the shadows and highlights. An image with low contrast is said to look flat or dull, while high contrast makes an image look punchy or “contrasty”. Saturation is the depth or intensity of the color. The lower the saturation, the less intense are the colors. They can look weak and pale. If you fully “desaturate” the colors, you end up with a monochrome, or black & white, image. On the other hand, if you increase saturation too high, the colors can become “oversaturated” and look unnatural. To illustrate the effects, let’s use an example from Antelope Canyon. 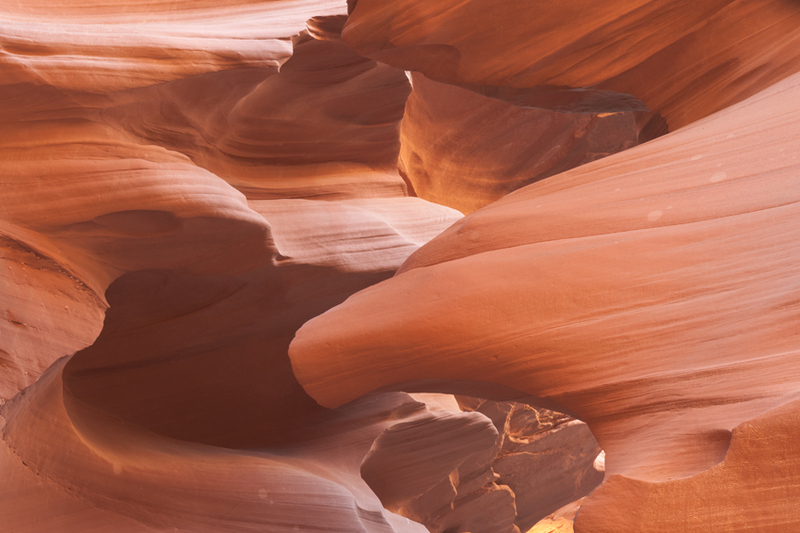 As you may know, Antelope Canyon was created by erosion of the Navajo Sandstone. As sunlight streams in from the top, it both reflects and directly illuminates the intricate walls and surfaces in the narrow canyon. With your camera’s white balance set on Auto, the prevalent orange hue becomes sort of a grayish orange in the Raw image. 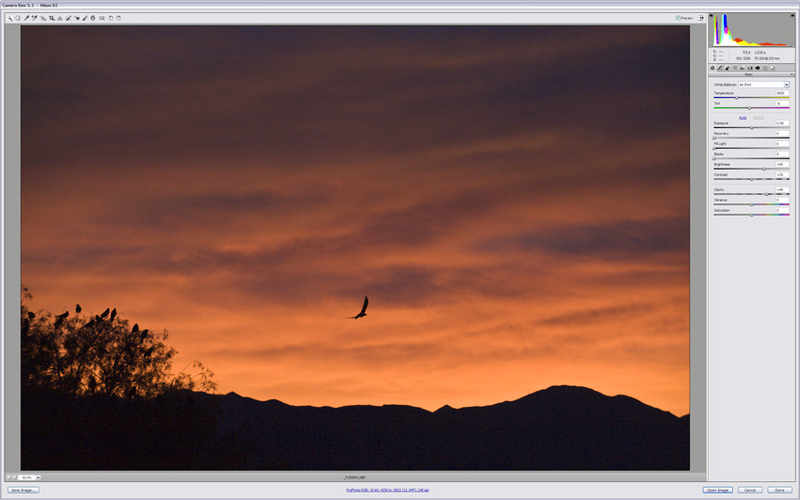 We’ll start with the unprocessed Raw image, shown below. As you can see, it’s rather flat and dull. I am honored to have been asked to join four other professional nature photographers (including my friend Bill Lea—who’s writing a book about the Everglades) for a NANPA (North American Nature Photography Association) photo adventure featuring five field trips in Everglades National Park. There will be both morning and evening shoots on Friday and Saturday, and a morning shoot on Sunday, all during the prime light hours. Critiques and Q&A sessions with the pros will be held midday at the hotel. The event will end with a farewell brunch on Sunday. It should be a fun, action-packed long weekend of shooting and image critiques. 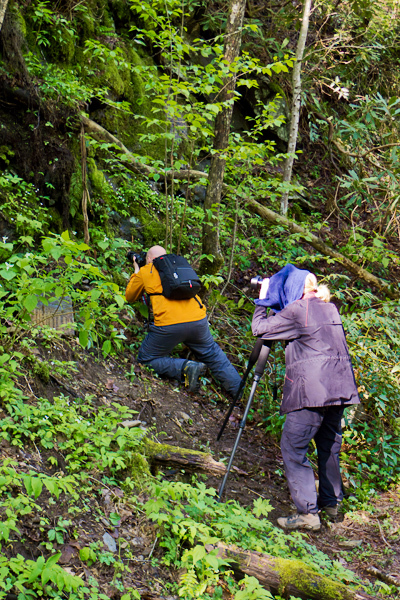 Choice of exposure mode always seems to generate a spirited discussion among photographers. Here’s my 2¢ about it. Actually, it’s a long post (probably more like 4 or 5¢), so you might want to grab your favorite beverage before settling down in the warm glow of your monitor. If you’re serious about your photography, you’ll need to use Program, Aperture Priority, Shutter Priority, or Manual exposure mode. Neither a fully Automatic mode nor any of the “Scene” modes found on many DSLRs allows you to override what the camera chooses for you. A camera’s meter is designed to determine the exposure that renders the scene as a mid-tone. But the actual scene may require a darker or lighter exposure than that. As with any other element of your photography, the correct exposure for a particular image is the one that shows the scene as you intended. This might be, and often is, different from what the camera meter indicates. Shutter Priority, Aperture Priority, and Program are known as automatic modes because the camera automatically sets the aperture, shutter speed, or both, respectively, based on the camera’s meter reading. In Manual mode, you set both the aperture and shutter speed, using the camera’s meter as a starting point. You can successfully use any of these modes (why else would they be there? ), but it’s worth finding one or more you are most comfortable with. I exclusively use Manual mode. I find it the easiest and most consistent for the kinds of photography I do. But I hope this discussion helps you choose the one that works best for you. I can hear several of my friends laughing even before reading the rest of this. After years of my staunch (they might say unreasonably stubborn) aversion to cropping, they’ve prodded me to realize that the camera’s default image shape doesn’t always result in the best image. It’s still my preference to get everything just the way I want it in the camera, especially with landscape images. But now, I’ve come to appreciate the benefits of the occasional crop. Sometimes, you have to crop to fit certain requirements for a website, client, contest, or publication. (Heck, even my header image on this site is cropped from a full frame.) Other times, a judicious crop just suits the image better than the camera’s default shape does. Now this is not a license to “shoot loose, and crop later”! That’s lazy, sloppy, reduces the resolution of your images, and is bad practice. Here’s an example of when cropping worked better than the default image shape. 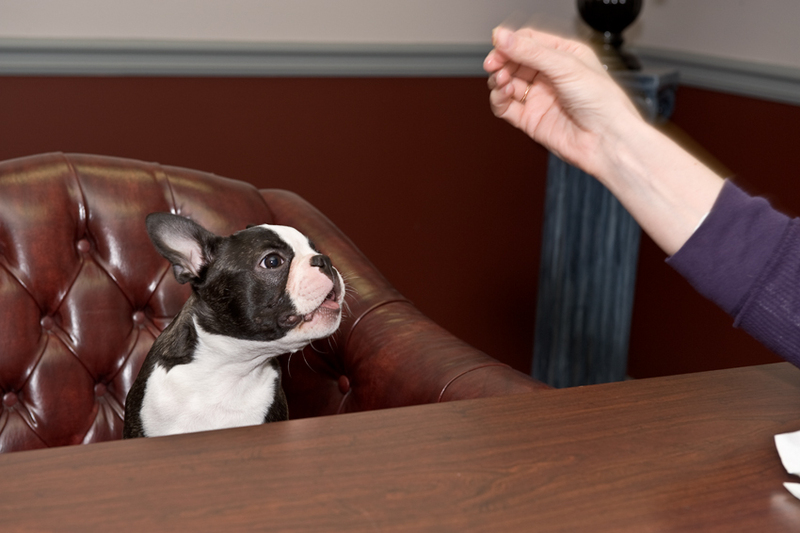 When she was a little puppy, my BFFFF (Best Furry Friend Forever, Fredo) came by my office for a visit. Well she didn’t come by on her own; her Mom brought her over. Fredo Singing (full frame). Click on image to enlarge. 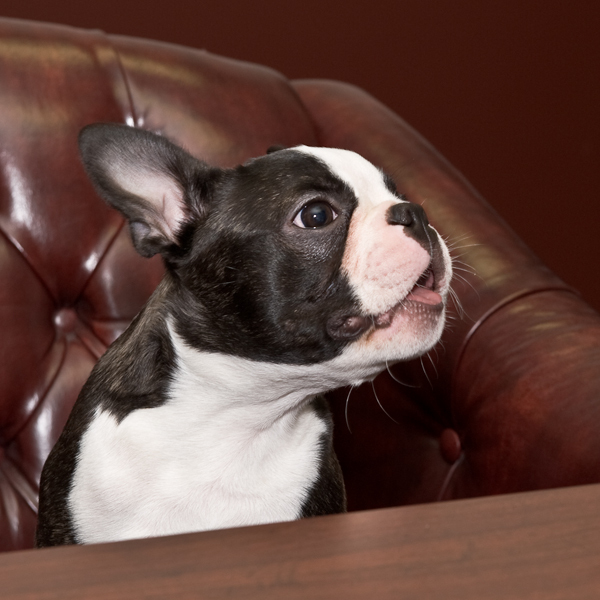 She was sitting in one of the conference room chairs while I was taking pictures of her. She was being so tolerant, it was time to reward her with another treat. I loved the expression on her face in this picture as she anticipated the treat. It looked like she was singing. But as a rectangle, the photograph was cluttered and distracting. I knew a square crop would eliminate the distractions, focus the attention on Fredo, and makes it look more like she’s singing. I framed the image so there would be enough room around her so I could crop it square, yet still retain a sense of place by including recognizable portions of the chair and table. I also placed her to the left side in case the rectangular shape worked as well. It didn’t. Fredo Singing (square crop). Click on image to enlarge. One of my main influences for thinking in terms of the square image is my friend and mentor Charlie Waite. For most of his professional career, he made landscape images using a Hasselblad film camera, which yielded a square image. A square format image often tells a significantly different story than a rectangular one. What I’ve learned is that cropping an image to improve its composition doesn’t necessarily mean the image was not composed well when the shutter was clicked. Sometimes, it’s just what you need to tell your story in the best way. 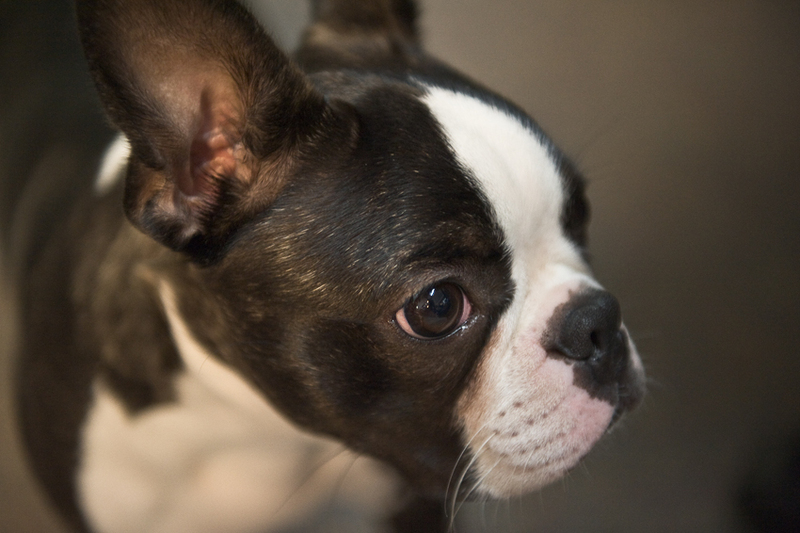 Maybe it’s just that a puppy taught an old dog new tricks. As you know, it is essential to travel long distances, preferably to exotic locations, if you want to make interesting images. Wait, maybe that isn’t really so. Roswell Road Bridge. Click on image to enlarge. This image was made less than two miles from my house. I had driven over this bridge thousands of times before without ever noticing anything special about it. 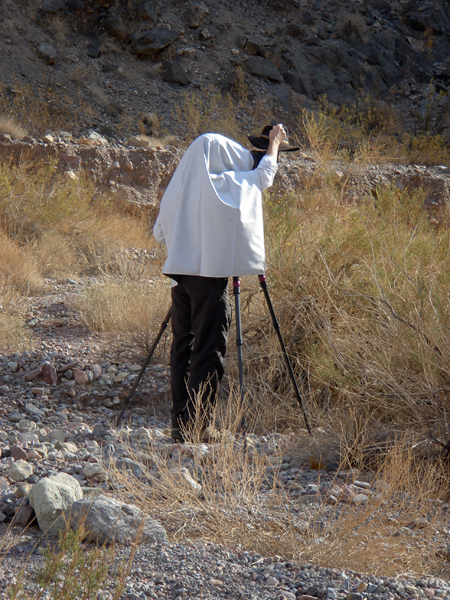 One day, a friend and I decided to go out shooting, so we grabbed our cameras and tripods, and walked along a paved trail along the river. The path led under this all-too-familiar bridge. It was late afternoon, and the sun was starting to go down to the right in the image. Our intention was to go past the bridge to another spot along the river edge. We never made it. We spent the next hour or so shooting various compositions, including horizontal (landscape) and vertical (portrait) orientations. Then I turned around, and saw a totally different view. Sun was pouring through the drainage slot on the bridge, and illuminating a pile of rocks below. When I saw that light beam, I knew I was going to process it as a black & white image later. 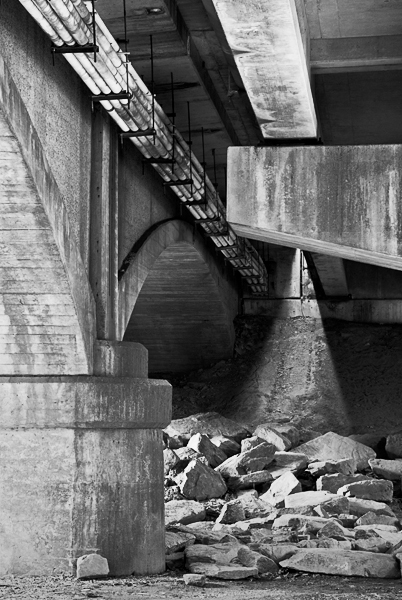 Roswell Bridge B&W. Click on image to enlarge. 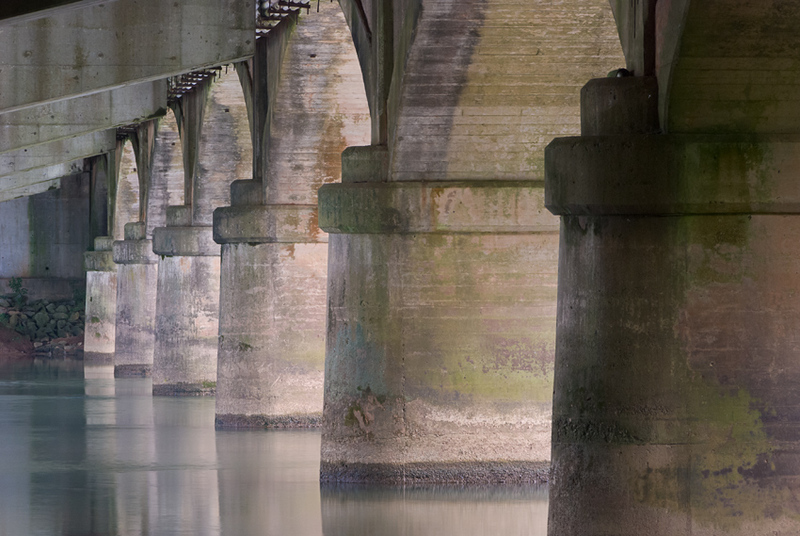 So in an hour, two miles from my house, under a bridge I had crossed thousands of times, I made two images that I liked. Funny thing is when I show them to people, and ask them to guess where there were made, I usually get somewhere in Spain or France as the reply. Of course, I always tell them they guessed right! Not really. To me, the real story is even more surprising. There are plenty of good technical explanations available on the web and in books to prove why this is so. But to save 3,000 words, here are three screen shots from Adobe Camera Raw (ACR) that should show the benefits of working in the largest space. Converting your RAW images to ProPhoto and 16-bit will give you the most data possible to work with in Photoshop. So once again, bigger is better. As far as bit depth and color space go, that is. When you see an image, you know if you like it or not, and will probably be able to describe why it affects you the way it does. Many of you have also likely had your images critiqued by a judge for a competition or by a pro during a workshop. Hopefully, any feedback you got was helpful, and allowed you to see any strengths or deficiencies in your image in a new way. But is it the “right” way? 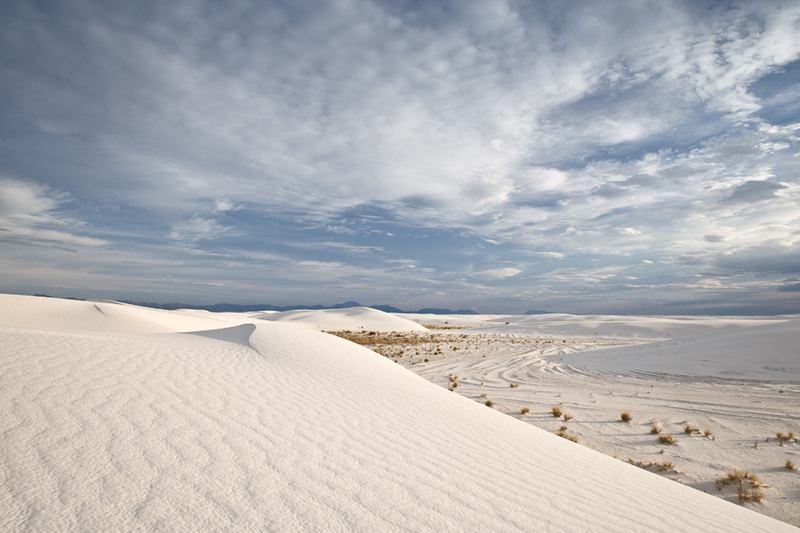 On two different occasions, I had two pros critique the White Sands image above, and got polar opposite responses. At a camera club competition, pro Craig Tanner said he loved how the story of the dune field was told in a single image, and how the different series of curves in the dunes, in the dune tracks, and in the clouds made a dynamic composition. It kept your eye moving around the image taking in all the elements of the scene. He gave it Second place in the Color Print category. When my friend and mentor British landscape master Charlie Waite critiqued this image during one of his Master Classes, I had to double-check to make sure he wasn’t talking about another image. He wasn’t. Charlie said it was a jumbled mess, with three unrelated stories mashed into a single frame. There were the graceful ripples and curves of the dunes at the lower left clashing with the discolored, harder-edged dune tracks with scrub bushes scattered about on the right. And that sky! Just too many unrelated shapes and textures to make a cohesive image. Not only were they commenting on the same image, it was on the identical print, so there was no variation there, either. So, who’s right? They both are, of course. Each viewed the image from his own unique perspective. Each had, and had clearly expressed, very valid points about the image. If we’re smart as photographers, we will consider all constructive criticism when evaluating our own images. We might then see ways to improve our images that we missed on our own. But we won’t make changes just to please the critics. As this example shows, we can’t please them all anyway, even if we tried. The moral: Ask as many friends and pros as you can to critique your images, but take their comments as suggestions, not gospel. There are no absolutes in photography. As Ansel Adams said, “There are no rules for good photographs, there are only good photographs.” And what constitutes a good photograph is in the eye of the beholder. Okay, here’s finally a link to the book you’ve heard me heartily recommend all these years. 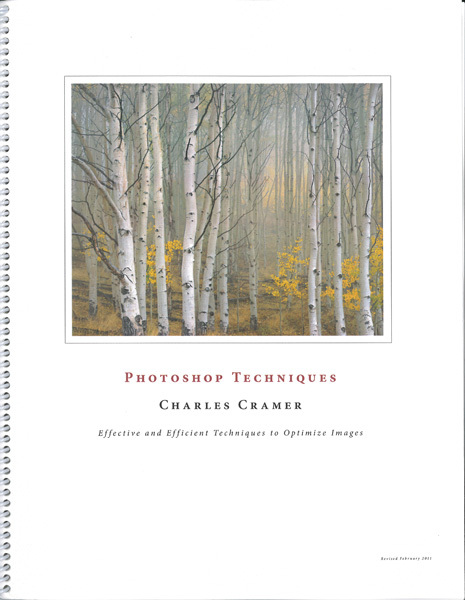 It is Charlie Cramer’s Photoshop Techniques workbook. This is the best-written, most useful publication I’ve ever encountered regarding post-processing. Just imagine a Photoshop book that is actually fun to read, easy to understand, yet contains the essentials for getting the most out of your images. And it’s all done just using Photoshop. Don’t rely on plug-ins to make your post-processing decisions for you. Learn to use the versatile tools you’ve already paid for in Photoshop. Not only will you learn how to optimize your image files, you will understand what you are doing and why you are doing it. You will learn to see what your images need, and how both global and local corrections can rearrange the light to more closely match the vision you had when you made the image in the field. In addition to the magnificent workbook, Charlie includes a CD with the example images from the book with all the Layers included. Using that CD with the book will not only demonstrate the technique, but allows you to turn off the Layer, and try it for yourself, using the same image. You can then compare your version with Charlie’s. It’s an invaluable learning tool. The workbook and CD are only $40, and are currently only available directly from Charlie. Please contact him at http://charlescramer.com/contact.html, and tell him I recommended his workbook to you. He will respond with how to make the payment. Before you know it, you will see a tremendous improvement in your images. Make sure you check out Charlie’s work on his website at www.charlescramer.com. 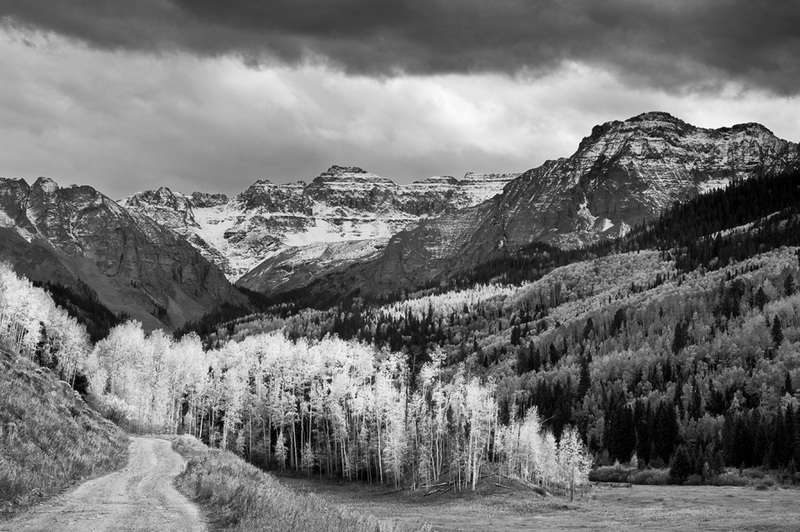 As a storm approached near Ouray, CO, the ominous sky made a great counterpoint to the trees and fall color.